Explanation: The Great Nebula in Orion can be found just below and to the left of the easily identifiable belt of three stars in the popular constellation Orion. This fuzzy patch contains one of the closest stellar nurseries, lying at a distance of about 1500 light years. 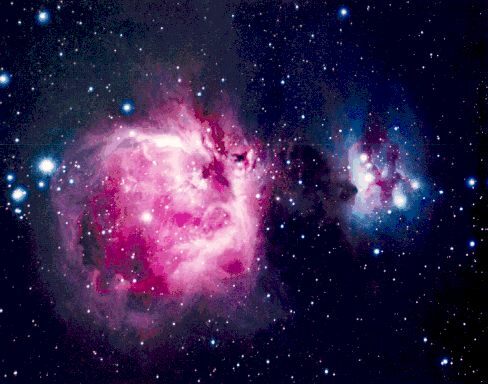 In the above picture, the red region on the left consists of nebulae designated M42 and M43 and contains the bright Trapezium open cluster. The blue region on the right is a nebula primarily reflecting the light from internal bright stars. Recent observations of the Orion Nebula by the Hubble Space Telescope have located solar-system sized star-forming regions.